It is a myth that you can’t shop online for a prom dress. Of course you can. You simply need to be careful when choosing where you buy from. Be sure that you see a photo of the real product if you’re purchasing from a seller off eBay for example – as many use authentic photos from designer brands and will then ship you the fake they’ve produced themselves. The best way to shop online for authentic prom dresses is to verify with the designer that it’s an official stockist. If you want to shop for Jovani dresses online, we provide a full list of verified online stores who sell our authentic designs. Buying from one of these stores is, therefore, a safe and easy option. If you’ve already bought a dress at a boutique and have your doubts about authenticity, there are several ways to confirm that it’s the real deal. 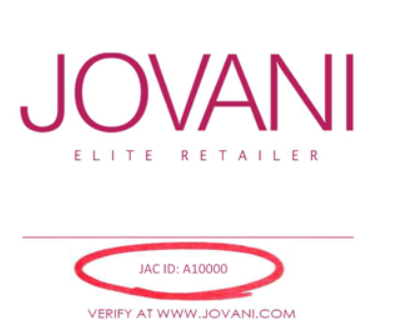 Each Jovani retailer has been issued a unique JAC ID. This should be displayed in store. You can take note of any retailer’s JAC ID and then check it on our authenticity page. If the result of your search shows the store you visited, you can be sure that they are an official retailer. You can also simply check our full list of retailers where you can search by country, state, etc. If the store’s name appears here, it is an authentic garment. If you have a login for our inventory or have downloaded our official Jovani app, you’ll also be able to search here for your particular dress by bar code. Jovani has innovated a search system for you to quickly and easily find any dress that we have produced. Check the tag of your design and input the bar code numbers into the bar code search system to check that it’s listed as an authentic product. What to do if You’ve Bought a Fake Dress? If you’ve already purchased a dress and can’t verify its authenticity, the next step is to report it to the designer. If you have a Jovani garment that you suspect is not authentic, you can contact us at: legal@jovani.com. Please share any information you have regarding where you purchased the item from and why you suspect it is a fake. If your dress is found to not be authentic, you should also report the store or website where it was purchased from if possible. When shopping online, check the designer’s site for a list of official, verified online stores. Check feedback, seller’s details and photographs carefully when using auction sites, verify the product is authentic before purchasing or making a bid. If shopping at a boutique, ask to see their official JAC ID if they stock Jovani collections. Examine the quality, fit and detail of the garment – is it made from the correct fabric, and are the details the same as depicted in any official photos? If you are unsure, always verify the authenticity before you buy. On the lighter side, check out some funny prom dress fails that have gone viral below – so you know exactly what you don’t want to happen!